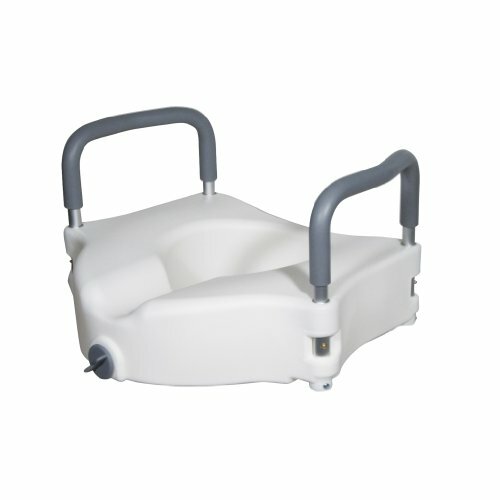 The Drive Medical Elevated Toilet Seat is expertly designed as a bathroom safety solution for individuals who have difficulty sitting down or getting up from the toilet. The newly designed locking device is engineered to fit securely on almost any toilet seat and is simple to operate. Lightweight, portable, and easy to clean, the Elevated Toilet Seat is crafted from heavy-duty molded plastic that is durable enough to withstand regular daily use. The Elevated Toilet Seat features comfortable padded arms for extra support that, if desired, are easily removable without tools.